You will cross the vast peninsula of the Médoc. The West is shrouded in light and sun with the Atlantic Ocean and its beaches bordered with an immense forest whilst the East located on the side of the Gironde Estuary offers the view of the wine-growing Médoc. First, you will take the “wine road” which picks off the most well-known chateaux: Giscours, Margaux, Pauillac, Lafite Rothschild, Latour and Mouton Rothschild…and you will furrow the wine-growing boroughs which own some of the most prestigious wine worldwide. The Medoc has also a great diversity of landscapes; a walk through the marsh, horse breeding and aquaculture. On the hill are located windmills and old castles. In the villages you will find some superb Roman Churches, and somewhere in the land, some unique Gallo-Roman sites. This journey with various landscapes alternates bicycle paths through forests and flat roads alongside streams and vineyards, will allow you to discover the exceptional natural surrounding which will fulfil you with its diversity. You will be warmly welcomed every evening in 3 or 4 star hotels and charming guesthouses. Day 1: Arrival in Bordeaux and transfer to Le Pian Médoc. Arrival at Bordeaux’s train station or airport. Taxi transfer to Le Pian Médoc and accommodation in a 3 star hotel. Welcome pack of the area and circuits will be given. The quality and the service of this hotel created a climate of peace and quiet which explains the “Grande histoire” of this traditional 18 bedrooms house with pool and a 6 acres park. Fine and gastronomic cuisine, with the specialities of the area and a wine cellar, containing several of the “grands crus” of the Médoc. Departing from Le Pian Médoc to Macau, the chateaux’s road goes alongside the Gironde toward Margaux, Saint-Estèphe, Moulis...wine and spirit houses are waiting for you. The Médoc area is well known worldwide because of the name of every village and every chateau make amateurs and wine passionate dream. One must stop in the little harbours such as St Julien in order to imagine that in times past, the “gabares” were rolling on the stream charged with barrels. This chateaux’s road which crosses the Médoc is assuredly one of the most beautiful! You will start your bike itinerary by crossing the vineyards of Margaux, Haut-Médoc et Moulis-en-Médoc with strolls among some of the most well-known Chateaux. If you go on jaunt toward the estuary, you will make the most of this itinerary without any difficulty whilst encountering pleasant and diversified landscapes whatever the season. 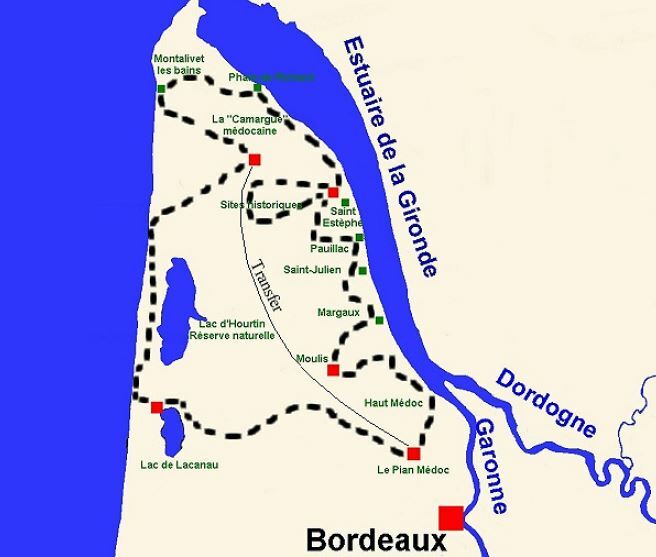 This circuit will lead you to the heart of the “Médoc rouge”. Departure from Moulis for a cycling day into famous vineyards, among the hills covered of vineyards and across the marshes that separate them. You will also discover the history of Medoc through its remnants such as walking across the archaeological site of Brion in St Germain d’Esteuil, the Chateau of Castera, the Abbey of Vertheuil and the Fort Medoc built by Vauban. The route will follow the “Road of the Chateaux” well known for their wine… and some Chateaux for their unusual architecture. You will go to Paulliac, the Médoc capital. Its 18 “grands Crus Classes” and its charming little harbour make this place an inescapable destination with glorious chateaux, from Latour to Lafite Rothschild. In the late afternoon you will be welcomed in a “3 epis”charming guest house located in the middle of the vineyards. This part of the Medoc fascinates those who take the risk to devote themselves to its charms. The incredible landscape offers to the cyclist new sensations, which only the sailors have in memory. Easy journey across the vineyards and marshes along the little Médoc villages. You will first go alongside the longest estuary of Europe. Wilder Médoc where fish and migrating birds find sanctuary. On the banks of the Gironde the scenery of tiny fishing ports remind the land of Carmargue. Some short stops are recommended by the banks of the estuary such as in St Christoly or La Marechale, small ports full of charms with their grounded boats. The lighthouse of Richard offers an outstanding view of the estuary. Do not miss the visit of Lesparre and its monuments and the visit of “Les Noisettines du Médoc”, a small company made by craftsmen creating sweets with hazelnuts as a main ingredient, exclusively using natural products. Return to your housing at the end of the afternoon. From the bank of the estuary to the one of the ocean across the massive marsh and the final vineyards, this stroll offers the three components of the Medoc: water, pine and wine. A big part of this circuit is on the cycle paths the rest is on little roads and quiet paths. The villages offer an interesting patrimony with pretty churches. You will go passed the Windmill of Vensac (authentic windmill still producing flour) and the pine forests which border the ocean. In the middle of the journey you will enjoy a bathing break at the beach of Montalivet-les-Bains before heading back to your housing. End of tour for the 6 days cycling tour. Transfer after breakfast to Bordeaux airport or train station. After passing the marsh landscape you will reach the encounter between the forest and the ocean, Hourtin plage with its wide coast and its dunes is a paradise for lovers. You will then arrive on marked paths across the pine forest and will cross a wild and protected territory with a rich and incredibly diversified fauna and flora. Thus, the Lagune du Contaut will be an ideal stop to picnic. The Medoc also shelters behind its dunes some vast fresh water lakes. You will cycle alongside the lake of Carcan-Hourtin one of the biggest natural fresh water lake of France, and the coastal beaches. From Carcan you will go down to Lacanau passing by the pond of Cousseau La forêt. The lakes, the pathways and the cycle paths are just harmony to your hotel, itself located in the heart of the 100 acres of pines, between lake and ocean. You will start your journey in a wild landscape; in the forest, in the border of the lake and alongside little picturesque beaches. The “green track” of Lacanau-Ocean was built on the top of the old railway. It goes straight ahead in the forest where the pine trees draw a corridor which can sometimes be quite draughty when the wind is blowing on the seafront. It’s a beautiful and safe circuit. You can stop half way through where the area has been laid out with tables, benches and a fountain; it’s in the shadow and very pleasant to shelter from the sun. At the end of the day you will arrive at Le Pian Médoc and will be welcomed in the same 3 star hotel as your first night. You will then end your circuit the same way as you’ve started it: in the heart of the Médoc. Day 8: Taxi transfer to Bordeaux’s train station or airport. 5 to 7 nights in 3 and 4 star hotels and charming guesthouses.